In the virtualization days I used to pad all my requests for virtual machines (VM) to get the largest size possible. Since decisions and requests took time, I would ask for more than I required just so I wouldn’t have delays if I needed more capacity. This resulted in a lot of waste and a term I heard often–VM sprawl. The behavior is different with Infrastructure-as-a-Service (IaaS) VMs in the cloud. A fundamental quality of a cloud is that it provides an elastic pool for your resource to use when needed. Since you only pay for what you use, you don’t need to over provision. Instead, you can optimize capacity based on demand. Let me show you some of the ways you can do this for your IaaS VMs running in Azure and Azure Stack. It’s hard to know exactly how big your VM should be. There are so many dimensions to consider, such as CPU, memory, disks, and network. Instead of trying to predict what your VM needs for the next year or even month, why not take a guess, let it run, and then adjust the size once you have some historical data. Azure and Azure Stack makes it easy for you to resize your VM from the portal. Pick the new size and you’re done. No need to call the infrastructure team and beg for more capacity. No need to over spend for a huge VM that isn’t even used. Another dimension of scale is to make multiple copies of identical VMs to work together as a unit. When you need more, create additional VMs. When you need less, remove some of the VMs. 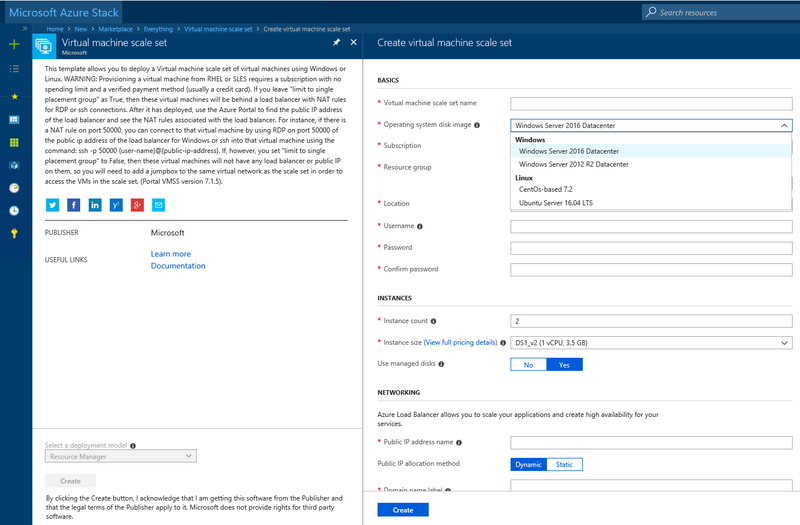 Azure has a feature for this called Virtual Machine Scale Sets (VMSS) which is also available in Azure Stack. You can create a VMSS with a wizard. Fill out the details of how the VM should be configured, including which extensions to use and which software to load onto your VM. Azure takes care of wiring the network, placing the VMs behind a load balancer, creating the VMs, and running the in guest configuration. Once you have created the VMSS, you can scale it up or down. Azure automates everything for you. You control it like IaaS, but scale it like PaaS. It was never this easy in the virtualization days. Just like virtual machines in the cloud, storage is pay per use. 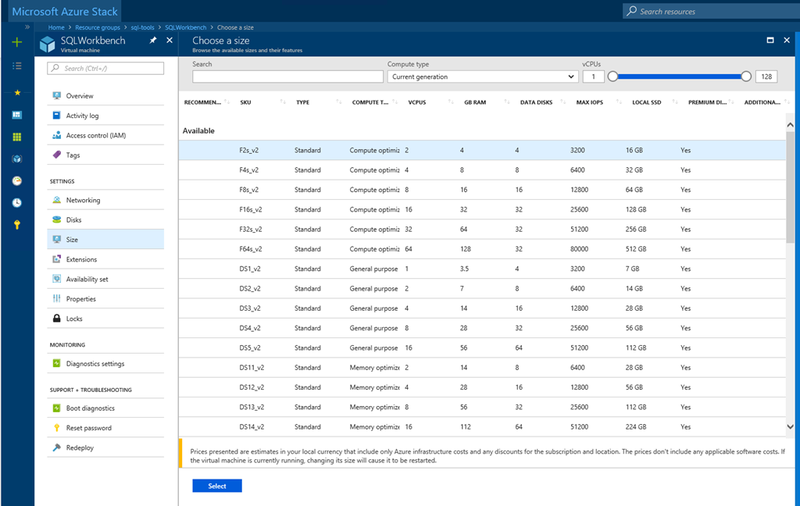 Both Azure and Azure Stack make it easy for you to manage the disks running on that storage so you only need to use what your application requires. 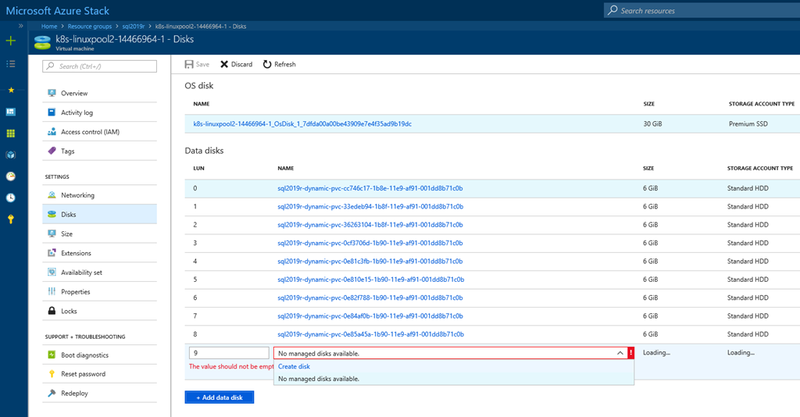 Adding, removing, and resizing data disks is a self-service action so you can right-size your VM’s storage based on your current needs. Just like Azure, Azure Stack prices are based on how much you use. Since you take on the hardware and operating costs, Azure Stack service fees are typically lower than Azure prices. Your Azure Stack usage will show up as line items in your Azure bill. If you run your Azure Stack in a network which is disconnected from the Internet, Azure Stack offers a yearly capacity model. Pay-per-use really benefits Azure Stack customers. For example, one organization runs a machine learning model once a month. It takes about one week for the computation. During this time, they use all the capacity of their Azure Stack, but for the other three weeks of the month, they run light, temporary workloads on the system. A later blog will cover how automation and infrastructure-as-code allows you to quickly set this up and tear it down, allowing you to just use what the app needs in the time window it’s needed. Right-sizing and pay-per-use saves you a lot of money.